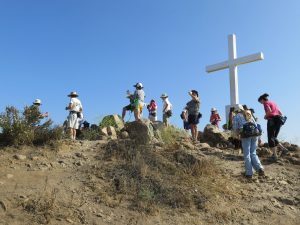 This hike is held during Daylight Saving Time only, between Sunday March 10th and Sunday November 3rd. Meet at 6 the parking lot, to the south of Donut Delite, located on the north east side of the intersection of Royal Avenue and Madera Road. On the western end of Simi Valley, Mt. McCoy is known as the hill with the large cross at the top. From the top of Mt. McCoy, enjoy breathtaking panoramic views in every direction, including views of the Ronald Reagan Presidential Library, Wood Ranch, Old Boney Mountain and the Channel Islands. Cut under the direction of the Rancho Simi Trail Blazers in 1997, the trail leading the top is 1.5 miles long and climbs 675 feet. It contains switchbacks surrounded by coastal sage scrub, chaparral and other vegetation. This is a mild hike and is great for all ages. From the top, there is a dirt track extending south toward the Presidential Library as well as a dirt trail extending north, down the mountain, to connect with Tierra Rejada Road. The Rancho Simi Recreation and Park District owns 200 acres surrounding Mt. McCoy. Note: Hike canceled on holidays, if it rains, or if there is a Red Flag Warning in place.